Wilburton Manor House from c. 1600. Wilburton Roll with ink damage. The Center for the History of Print and Digital Culture is helping to digitize some of the manuscripts held in the Special Collections Library at the University of Wisconsin, Madison. The digitization initiative will bring certain manuscripts, which usually sit in a vault, to the attention of a broad audience. The first set of manuscripts has specifically been chosen for display in DM, a digital platform that allows for rich annotation, scholarly editing, and publication. But before the big reveal in DM, here are some behind-the-scene glimpses of what it means to digitize a medieval manuscript and why the CHPDC is supporting this project. 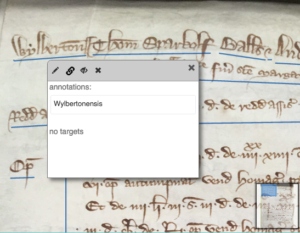 What does digitizing a medieval manuscript really mean? For many, the process is simple: take a photo and put it up on a website with a bit of information. But where does that “information” come from? 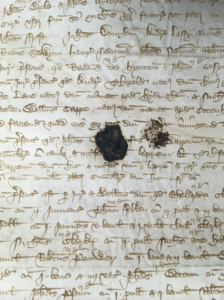 As I have been working through the fourteenth-century Wilburton Manor Rolls held in the University of Wisconsin’s Special Collections Library, I realize that no part of the digitization process is as straight-forward as one might assume. If the rolls are to be digitized, someone must create the metadata to accompany the images. And if the metadata is to be accurate, then the document needs to be examined in depth. Indeed, the story that the metadata itself tells cannot be underestimated; it is as important as the stories held in the documents themselves. In the case of the Wilburton Manor Rolls, things can get very interesting at the intersection of metadata description and physical document. The University of Wisconsin Library has a system and procedures already in place for digitizing documents. The metadata file format for the Manor Roll project is not complicated. But I was stumped with the first required field: “Title.” Simple enough right? Think again. In my conversations with people at the university, the medieval rolls from England had always been referred to as the Wilburton Manor Rolls, or sometimes the Edwardian or Ricardian Rolls. My instinct was to assume this to be the case and entered “Wilburton Manor Roll” as in the title field without thinking any further. But as I wrote it down in the box, I hesitated, and looked at the pieces of parchment lying in front of me. 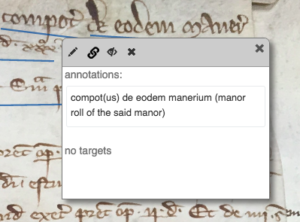 The top line notes that this roll is a manor roll, not a court roll. Were they really manor rolls? Did they indeed originate in Wilburton, a town in Cambridgeshire, England? After transcribing much of the Latin, examining the content of the writing, and researching secondary sources, I realized that the rolls consisted of two types: manor rolls (computi), as well as Hundred Court rolls. And even more interesting, not all were from Wilburton. 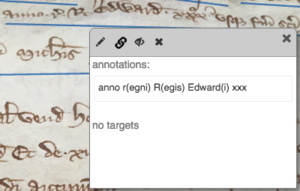 The top line here notes that this roll was made in the 30th year of Edward I’s reign. In fourteenth-century England, a century that witnessed the reigns of Kings Edward I, II and III, it was common practice among the lords and ladies managing manor houses to keep accounts of incoming and outgoing expenses. It was also common practice within an administrative district known as the Hundred Court to document the summaries of cases that had been brought before them. The term “hundred” likely originates from the notion that said county/shire would be able to provide a hundred men of arms. Alternatively, it may be that the “hundred” was based on the approximate number of hearths or homesteads that supported the county. The “hundreds” were part of Common Law in fourteenth-century England, unlike the manor courts, which originated in feudal law. The two could overlap however, and this may be what happened in Wilburton; the Lord/Lady of the manor took on the role of chief official and judge of the court, replacing the sheriff. The rolls held at the University of Wisconsin include Hundred Court rolls, as well as diverse account rolls from multiple manors, both types having connections to the manor and town of Wilburton. The first word here indicates the name of the manor. So what about the parchment rolls I found for Stretham, Lyndon, Donnington, and Littleport, manors within the same “hundred” as Wilburton, but directly associated with the manor of Wilburton? It turns out that the earliest manor rolls, all from the year 1302, include five different manors, only one of which is Wilburton. Having examined the rolls more closely, I was feeling much better about what to enter in the “title” field for the metadata records. The first stage of the digitization of the fourteenth-century rolls held at the University of Wisconsin is now complete. After collecting and entering the metadata, what have we got? 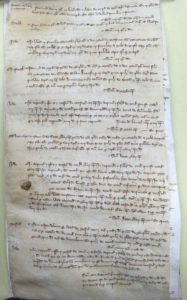 1302 – Five manor rolls from the manors cited above. 1303 – Manor roll from Wilburton Manor. 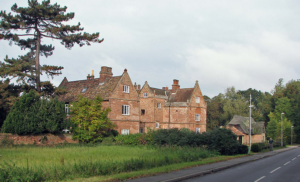 1324-1327 – Four manor rolls from Wilburton Manor. 1364-1371 – Seven Hundred Court rolls from the “hundred” district in which Wilburton was located.